The Feast of Tabernacles is a time-honoured season for God’s people to go up to Jerusalem. It is the greatest of three ‘pilgrim festivals’ the children of Israel were commanded to attend (Lev. 23:39-47). Yeshua would have kept this Feast every year of His earthly life (John10:2-53). It is an ‘appointed time’ not only for generations of Jewish people but for all generations of His people – including those yet to come in the Millenium (Zech.14: 16-19 & Rev.21:3) Our WJAS Tour has been designed to enable you to experience the liturgical richness of this biblical festival not just as a tourist but as a pilgrim. It is not only an appointed time but an anointed time to celebrate the Feast together with Jewish and Christian believers from all over the world. This action on your part will be prophetic of the fullness of the Gentiles which will lead, in turn, to all Israel being saved (Romans 11;25,26). Many babies have been born king but how many kings have been born a baby? Whose Bride 6: the seven seals: apocalypse now? Introducing the seven seals in the Book of Revelation. Whose Bride 4? Increasing rewards for the 7 churches. This is the second message in a series of 10 studies on the Brides who are revealed in the Book of Revelation. LUNCH: Tea & Coffee will be available: BYO Food. A love offering will be taken for the speakers. Christine was born in Australia, but she is a true Jerusalemite having lived in Israel for just on 40 years, with all of her five children being born in Jerusalem. Living through wars and terror, she can testify to the saving power of God shielding and healing her loved ones on many occasions. Christine is a keen observer of international news and writes regular prayer updates about the ongoing Middle East situation. She has a “ministry of helps” as detailed in 1 Corinthians 12:28. Christine’s speaking ministry extends into the UK, USA, Singapore and Australia. 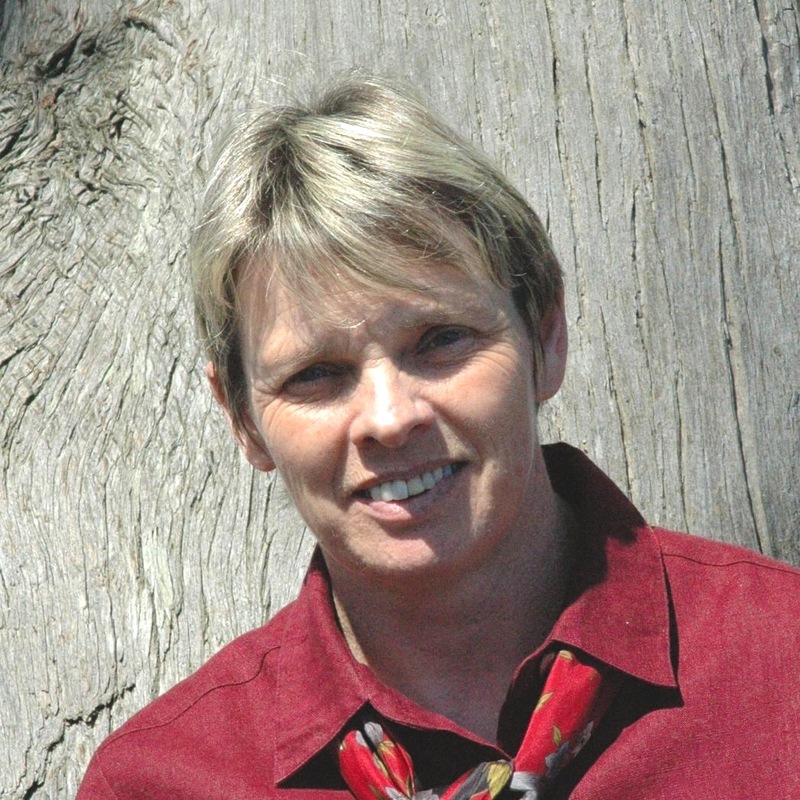 Her messages are seasoned with a unique sense of humour, while also providing a practical approach to intercession…… ‘praying for the peace of Jerusalem’. Four of her children have served in the Israeli Army, and her youngest daughter is currently employed as an officer in the Air Force. This has brought Christine into close contact with bereaved families and grieving soldiers resulting in her having developed a deep understanding of the mental financial and physical struggles that these young people and their families endure. 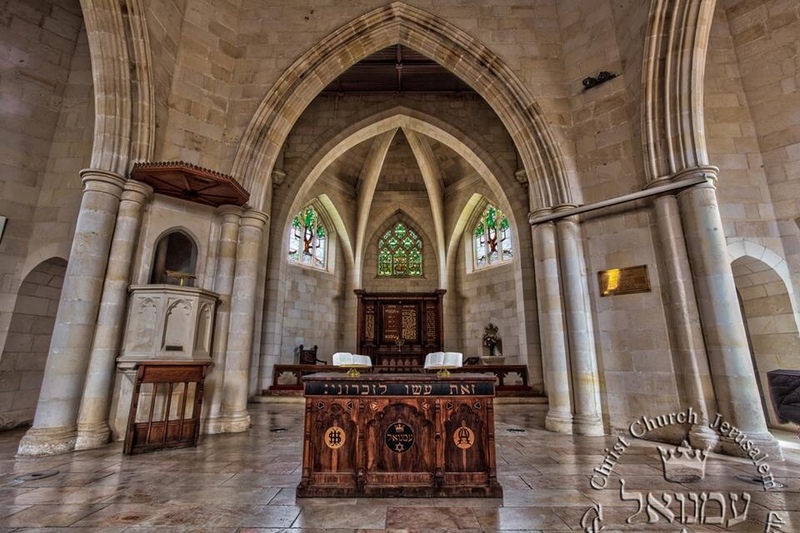 The Narkis Street Congregation in West Jerusalem is Christine’s home Church where she serves on the leadership team, and where she is also a frequent speaker as well as being active in their social outreach programs. If you are a believer whose faith stands on the steadfastness of the Word of God, explore this: Tabernacles is a Biblical and historical feast with a profound prophetic purpose. The Feast plays a major part in the outworking of God’s End-Time purposes and so carries considerable ramifications for the Church. Consider its timing – and specifically the international Christian observance of the Feast in Jerusalem since 1979. Israel’s God is mightily at work in the midst of the earth today. As they so often do, His acts defy complete comprehension. Yet it is clear He wants us to be aware and to participate in what He is doing. Foretold repeatedly through the prophets of old is God’s intention to gather His dispersed Chosen People from the four corners of the globe and bring them back into their own land. We are living in the middle of the realization of this pledge. To the mortification of the God-rejecting nations, the Jews are being brought back to – and planted in – the land determined by Divine decree to be exclusively theirs. According to the Bible, hard on the heels of their phenomenal physical reconstitution will come her spiritual rebirth. And it will change the world. God has determined to pour out upon this nation – but only once they are back in the land – the spirit of grace and supplication that will result in the circumcision of their hearts. And so all Israel will be brought into the New Covenant relationship with the Almighty promised in Jeremiah 31:31. Then – and only then – will God set up the Messianic Kingdom on earth. As His plan unfolds precisely according to the age-old blueprint, Islamic nations, communist nations, secular humanist nations and once Judeo-Christian nations – OUR nations – are rallying against it. The international community has long been working to reverse the physical restoration of the Jews to the biblical heartland of Israel by conjuring up in that very place an Arab state called Palestine. Thereby (whether they believe it or not and realize it or not), the nations are out to forestall and, were it possible, thwart the glorious purposes of God. When – as Christians from these increasingly hostile and determined nations – we come to Israel to celebrate the Feast, we come to worship the Lord, to proclaim His promises to the people and land of Israel and in faith, with conviction, to do exploits that spiritually support the restoration of Israel. If you don’t get it, if this strikes you as error – then go, I urge you, into your prayer closet with the One you call Lord. Ask your heavenly Father to reveal His truth on this vital matter. And ask how He would have you respond. Did you know that the next Feast of Sukkot (Tabernacles) will be ushered in by a ‘blood moon’ (total lunar eclipse) on September 27th? Not just any blood moon but a super blood moon. This occurs when the moon is at perigee – closer to the earth than at any other time of the year. 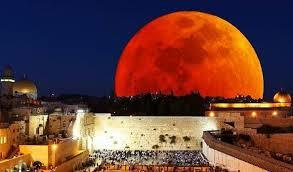 Given that it will be centred over Israel, it will appear 14% larger than a regular full moon there. There has never been a super blood moon on the Sukkot following a shemitah (Sabbath) year before. The Bible sets shemitah years to occur every seven years as an economic reset year; debt is eliminated and slaves go free. To give the land a chance to rest. The current shemitah started in October 2014 and goes until 13 September 2015. The last 2 shemitah years – 2001 and 2008 – have seen highly significant financial crises. The Jewish Talmud (book of interpretation) says: “When the moon is in eclipse, it is a bad omen for Israel. If its face is as red as blood, (it is a sign that) the sword is coming to the world.” In other words, it is a portent of judgement or war in their view. In Genesis 1:14, we read that God created the sun, moon and the stars not only to give us day and night but also as prophetic signs. During the period from April 2014 to September 2015, there will have been a ‘tetrad’ (four) of these blood moons, each one of them falling on the full moon festivals of Passover or Tabernacles. As stated, however, only the last one will be visible from the Land of Israel. (Heavenly signs are not considered by the prophets to be significant unless they are). The above photograph gives you some idea of what will be seen (weather permitting) from Jerusalem on the evening of September 27th. As you can see, it is going to be an amazing spectacle. More than this, however, if the prophets (both Jewish and Christian) are right in their understanding of the times, then has the time come for you to throw caution to the winds, seize the day and make the trip which has been on your bucket list all these years. Can you afford to put it off any longer? Visit <cmj.org.au> for information re this window of opportunity. What is Pentecost / Shavuot?